Just Fractions! gives you fraction math problems to solve against time! Just Fractions! also shows you how to solve fractions with step by step detailed instructions. 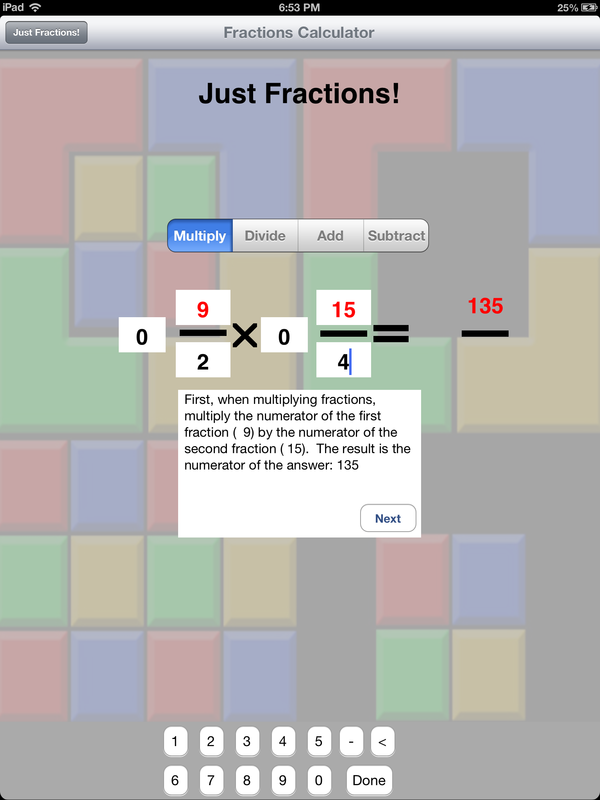 Many other features make this an award winning fraction app for students! Just Fractions was the idea of my then ten year old son, Seaghan. He was in 6th grade and was learning mathematical operations with fractions. He was unhappy with the fact that when you do fraction math on a calculator it always gives you the decimal equivalent, but that does not help young children learn how to add, multiply, divide and subtract fractions with the concepts of reducing, finding least common denominators and so forth. Seaghan has a good grasp of math and wanted to try his hand at coding the actual app. I helped him learn some basic programming skills and he wrote most of the fraction math logic and designed most of the screens for the initial release of Just Fractions. Just Fractions was initially released in March of 2009. Since then it has undergone many updates and improvements including development of a universal binary version which enables it to take advantage of the iPad devices. Seaghan and I worked on it for 3 or 4 months for the initial release. What is your favourite feature in this app? My favorite feature is the “Show Me” feature in the fractions calculator that gives the student a step by step view on how to solve a fraction problem. My favorite page is the “Test Yourself” page which has a timed game for the student to solve problems against the clock. This app is designed to help young students develop a better understanding of how to do fraction math using Multiplication, Division, Addition or Subtraction. 9-15, although I have adults who find it useful too! We update frequently and will probably have a new update near the first of the year. Thank you so much for helping us understand more about your app.